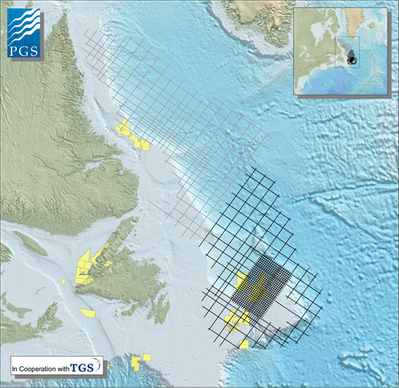 PGS in cooperation with TGS begins data acquistion on a new 20,000 km MultiClient 2D survey over the Northeast Newfoundland Shelf. The M/V Sanco Spirit has returned to Newfoundland and Labrador once again utilizing PGS GeoStreamer® broadband technology. Data acquisition will continue into early Q4 2012 and the vessel will complete the survey in 2013. “Northeast Canada and the far North represent some of the most exciting new deepwater exploration areas in the world today and broadband GeoStreamer data provides an ideal foundation for building a better understanding of its potential,” commented Jerry Witney, PGS Vice President MultiClient, North America. The survey area covers oil discoveries including Hibernia, Terra Nova, Hebron, White Rose and the recent Mizzen discovery. Initial data will be available for viewing during Q1 2013. The survey is supported by industry funding.